Here is a brief video explaining what you do during the ceremony. It’s easier than you think. Watching this video often eliminates the need for us to be at your formal rehearsal – thereby saving you the $100 rehearsal fee. For “out-of-state couples” only – the Brevard County Courthouse only charges $86 to provide the marriage license by mail. Avoid the middleman companies that were charge you $200. New and updated. Same kit seen on other bridal websites. Shave 5 hours off the name change process and avoid multiple trips to the DMV or Social Security office by following the right system. 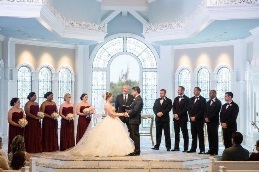 Meet your officiant and go over your ceremony options as though it was a “mini” rehearsal. “Warning: Don’t Hire an Officiant Without Reading This”. Twelve questions to ask to make sure the quality of your ceremony is protected and special.